This used to be a two way street once upon a time. Now you go the same direction on either side. Along Philadelphia St, I believe, in York. If there is a overhead sign with a US 30 shield on it, why have a smaller shield on the support post on the far right. I just wanted to get a picture of something inside Lancaster that is remotely related to the Lincoln. This streetsign attached to a building was my solution (for the time being). This practice is likely from before WWII, for I've seen this in Bryn Mawr, Pa, in Westerville and Columbus, Oh, and Newport, Ky. as well. 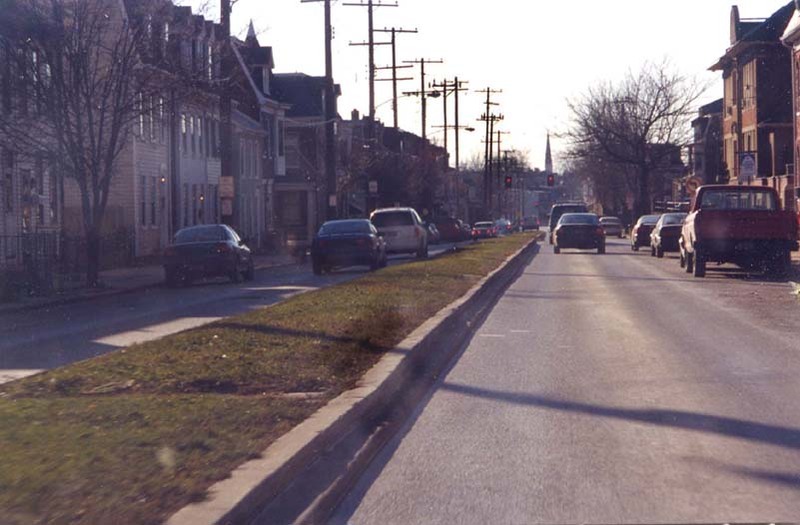 Walnut St is one way WB (for Pa 462 & 23) through Lancaster, and was never part of the Lincoln Hwy (King St is the original LH routing through Lancaster, but is one way EB today). Between Paradise and Soudersburg (I've been incorrectly saying Kinzer for a year), US 30 is 4 lanes wide. However two of those lanes are for traffic to turn left, one for each direction. I haven't seen that elsewhere in my travels. What you have identified as double turn lanes between Paradise and Kinzer is in reality a photograph of a section of the Lincoln Highway between Paradise and Soudersburg, west of Paradise. I grew up in this area and I have seen this section of highway change over the years. My earliest recollection is that this section of highway allowed passing in both directions and the speed limit at that time was 55 for cars and 45 for trucks. Sometime during the mid-1970's the tourist traffic became so dense during the summer that the locals asked to have the passing lanes made into left-turn lanes and the speed limit reduced to 45 for all vehicles. The speed limit was further reduced after a section of the highway between PA896 and the Rte 30 by-pass was widened to five lanes about ten years ago. From Ronks Road at the west end of Soudersburg (just west of Miller's Smorgasbord) the speed limit was dropped to 35 for east-bound traffic and stays at that low speed for several miles until reaching the east end of Kinzer (just before reaching the Rough and Tumble grounds, site of the Old Threshermen's Reunion each August). The west-bound speed limit matches the east-bound limit except for the stretch you have pictured. This section has been posted with one sign that sets the limit at 40. When you crest the rise ahead of you in this picture, the limit drops again to 35. Here is an example of an early Pennsylvania Keystone Marker. Located near Paradise, does Leaman Place still exist? This non-descript Railroad bridge was built several years ago to replace a 1914 bridge along the Lincoln Highway in Paradise (unseen to the left would be a 1928 LH concrete marker as well). This farm is along an original alignment of the Lincoln Hwy, east of Gap. I find it interesting because it almost seems to have taken over that portion of the LH (thus I feel like I would be intruding on private property to go by there). Oops, Contractors downgraded US 30 to a state route. This one is on WB US 30 @ Pa 10 near the Chester/Lancaster Co. line (While not in Lancaster Co, it's not really on the Main Line either) . Someone made the same mistake on EB US 30 @ Pa 41 near Gap as well (since corrected? ).